has selected London architectural firm Gort Scott to design the £10 million redevelopment of St Hilda's College. The redevelopment project will mark the 125th anniversary of St Hilda's, one of 30 colleges at Oxford. Gort Scott beat off competition from four other studios, Hall McKnight, 6A Architects, Tim Ronalds Architects and DRDH Architects. 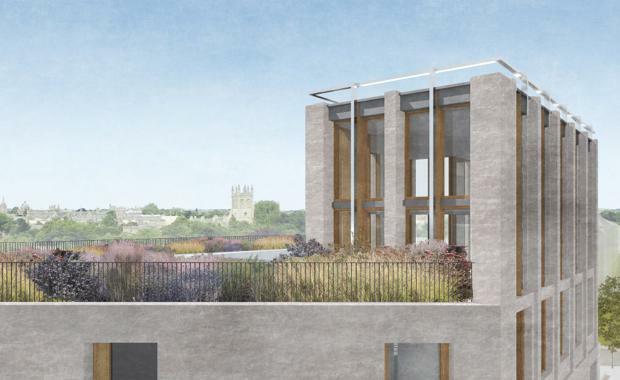 Gort Scott's proposal features a new tower entrance to the college from Cowley Place, a riverside pavilion linking to a paved courtyard, rooftop gardens, a suite of teaching and common areas and accommodation for student fellows. "Gort Scott won the college over because their concept design displayed the most intuitive and natural fit to our organic site," college principal Gordon Duff told Dezeen. "This development will transform the college's public face, refresh our rare and lovely riverside setting, and provide much-needed modern spaces and amenities," he continued.